Congratulations to the winners - Michelle Brigham, Yvonne Li, and SNJ! As of today All Things Paper: 20 Unique Projects from Leading Paper Crafters, Artists, and Designers is in bookstores across the United States! Worldwide distribution is underway. It's available via online book suppliers, and there are Kindle and NOOKbook versions too. It has always been my intention with this blog to share distinctive things made of paper, and the projects in the book follow that premise. All are brand new and were created by artisans whose names you might recognize, as each has been featured here in the past. In fact, that's how the idea came about... I had the thought to bring together designers who could show just how capable and surprising simple paper can be, by making items that anyone would be proud to display in their home, wear as a fashion accessory, or give as a special gift. The images shown here are just a small sampling of what you'll find inside. And so it began... many months, emails, and mouse clicks later, the result is a collection that is not only attractive, but useful too. It was very important to all of us that the projects hold up to their intended purposes, all while looking stylish indeed. One of my favorites parts of the book is that you get to know the makers... each tells why they work with paper and how they came to create their particular project. You'll also find step-by-step instructions and photographs, tips, templates, diagrams, and supply sources... everything needed to successfully recreate each design. A few of the projects are quite simple, while others will appeal to adventurous crafters who are interested in learning new skills. What better way to celebrate than with a worldwide giveaway?! Tuttle Publishing will send a copy of the book to three commenters. Winners will be selected by a random number generator and notified via email, so be sure to include a way to be contacted within your comment. If you would like to share the link as an extra entry, let me know in a separate comment that you have done so. Giveaway ends on Sunday, June 16. Good luck! Such beautiful work. I would love to find the time to work on some of these type of projects, but with 3 5 and under time is sparse. Congratulations on your new book! Those pictures are fabulous! I am a new reader and have been inspired by your site to try my hand a quilling and other paper crafts. I have recently started into Papier Maché, découpage, and other methods and am working on several designs. I hope this book starts a new craze in paper. Congratulations! I have followed your blog and FB postings for the last year so am excited to see it all put together in a book. Paper is my medium of choice these days and I am fascinated with all the other paper-crafters you are finding out there. Congratulations on your new book Ann. I am sure it is a super fabulous book . congrats on the book, have been enjoying checking out all the paper crafters on your blog !!! Spectacular new book! These days with Pinterest, I don't buy books anymore, but I find yours so beautiful, if I don't win, I'll be buying one! Checking out the beautiful things you have posted is one of the highlights of logging into FB, and have used the ideas there many times. I got so excited when I saw you had a book coming out, it's now on my Amazon wish list! Congratulations! I've been following your blog for a while via the RSS feeds, and I never skip your posts. There are amazing beautiful things that can be made with paper! I also like it that different artists are featured in the book, and that we get to know a bit more about them. I L.O.V.E. to recycle and reuse paper into beautiful things!! Many Congratulations....Super cool projects are showcased...Love to win this :) Thanks for the chance!!! Such a wonderful book! Congratulations! Congratulations on the book. It looks beautiful! congratulations on the book, I have been following you for quite sometime and love the inspiration by all the paper crafters on your blog. It is so important for me to know the person behind the art as it gives a different perspective to the Art; and you have brought so many awesome artists close to all of us!! Thank you so much Ann for this and best wishes for the success of your book!! congratulations on your book. sure is every crafters dream. thanks for the chance. Book looks wonderful. I especially like the clever idea for a letter holder. the detail you put into all your work is amazing. can't wait to see the inside contents of the book! I love your work - would love to be able to do it myself. Good luck with the book. Amazing collection of projects (just from looking at the cover and preview!) I love working with paper and think its great whenever a new book is published that shows everybody how versatile it can be! Congratulations, Ann! And I couldn't wait. Bought mine today. Anxiously awaiting its arrival!! Wow! Congrats, Ann! Your endeavor and hard work have paid off! That's wonderful. I'd love to win a book. It looks beautiful! beautiful book ! I love paper crafts so much ... ! I shared it on +Google. I'm happy to spread the word about anything related to paper! I shared it on twitter. I shared it on Facebook too. Thanks so much for your generosity. I hope you get a lot of publicity for this! Best wishes! Congratulations. I'm looking forward to seeing your new book, it looks wonderful. Congratulations on the release of All Things Paper! I can't wait to try out lots of new projects! Oh, well done! Isn't seeing your finished book such a thrill?? Congratulation -A must have for all paper lovers. Waiting to be able to buy it in Europe. Congratulations on such an inspiration book. I will have to add this to my wishlist! Can't wait to explore your blog even more. how pretty! congrats and thank you! Love all those samples you're showing. I know the rest of the book has gotta be good. Thanks for the giveaway. How awesome. This book looks amazing! What a fun book! I can't wait to get my hands on a copy. This is a wonderful collection of creativity!!! The projects look just awesome. It will be delight to have it in my collection Thanks for the chance to win. Congratulations on your new book. The ideas will be a inspiring resource to all paper lovers! I love paper and the work with paper and I will love this book. Congratulations and thanks for this giveaway! What a wonderful giveaway, Ann!!! Congratulations, the book looks awesome. Congratulations, Ann! I love the sampling photos, makes me think of all the other goodies inside the book! Congratulations Anne on the launch of this marvellous book. Interesting projects! Love your quilled pendant. Book looks amazing, only tried really simple teabag and iris folding in the past. Would love to try this. The tote is wonderful; everything is. The book looks incredible. Thanks for the chance to win! Just for the tutorial of your antique key pendant Ann it would be great to win this book. Thank you for all your posts I receive in my mail. Wow! Ann, Congratulations. You have such an inspiring blog and Facebook page and it frequently sends me on a research fever. Would love to own a copy of this book, what a fabulous reference and resource book for any avid crafter. What a great book. Looks like some fun projects. Would love to win it. I really enjoy getting post from you, they are often very inspiring. 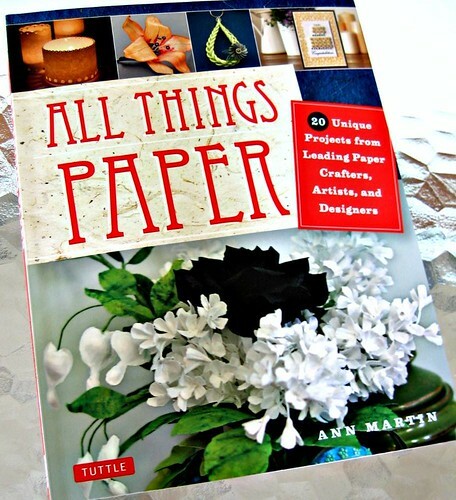 it must be so satisfying to see your new book "all things paper"being released into the bookstores!!! i love the sneak peaks you are posting. i cant wait to see the book here in oz!!! i new you could do it!!! Such an awesome book. Congrats! I have to have a copy! What a wonderful giveaway!!!! I look forward everyday to seeing what 'paper wonders' you have found for us...how much fun it would be to be able to relax and read in detail how things are done - thanks for the chance to win!!! Are you kidding??? Of course. What a beautiful book. Thanks for continuing to share all the beautiful paper art you find. And thanks for the chance to win a copy of the book! Recently found your blog and love it!!! I knew I had some quilling paper stashed in the barn so I just went out and brought it in so I can make the bird necklace. If it works out, I am going to enter it into the county fair later this summer. Thanks for the chance to win the book--I'd love to have it. I have been a paper fan for about 40 years and have always seen it as a great way to express yourself. The book looks fabulous! Thanks for being generous enough to host a giveaway. Paper, paper, paper! Smooth and crisp to textured and soft as suede...fold it, tear it, cut it, color it, paint it, write on it, or just look at it, touch it, smell it...aaahhh, paper. Thank you for putting together a book of wonderful projects and for giving one of us a chance to win a copy. I've had a love affair with paper since I was a child. My parents even had to hide paper from me to avoid a house filled with paper chain jungles! This book is right up my alley and I like what I see from the few photos posted here. It would be a welcome addition to my library and a great inspirational reference and resource. Hats off to all the contributing designers and to you Ann for bringing this to our attention! These projects look incredible! Paper has to be my favourite medium to work with, and is so beautiful. I would love to try out some of these projects! Oh, my email is mbrigham7@yahoo.com! congratulations on your new book. your blog is always a source of inspiration for me. thanks for the chance to win! What a fab giveaway! I totally love that antique key pendant! Wow! These actually are paper projects that I hacen't seen before. It looks very promising! I'd love to have the book! Thank you! Oh I just love your blog...it has opened my eyes to all the possibilities of paper! Can't wait to read the book! I also posted to facebook, so all my paper crafting friends can join the frenzy!!! Congratulation on your new book.Thanks for the chance. Paper flowers are some of my favorite projects, so the Crepe Paper Lilacs would be neat to learn. The Everyday Tote Bag would be fun too. The book looks awesome! Would love to win one! Thanks! Stunning work. I like your new book and your website. First time I have been here. Thanks for the giveaway chance. All your wonderful contributors have thought outside the (cardboard) box! Can't wait to see the book. oh wow, your book looks fabulous, and if it's anything like your blog then it will be a must-have. This is a inspiring book that I'd love to win. Congratulations! The book looked fantastic. I'd love to have one. Thats a good deal. Would like to have one. Many congratulations on the new book, Ann! Such lovely and inspiring ideas - I am crossing my fingers :-) ! What stunning images! Congratulations on bringing so much inspiration together! Congratulations on your new book. Looks amazing. I just shared this link with all my FB friends. I hope they visit and buy the book, too! it looks like an awesome book! This looks to be a beautiful book! Best wishes and much success with your publication. Would LOVE to own a copy. Weather I win or not I will order this book. Can't wait to open the covers and discover what joy is inside. Thank you for sharing with us. This looks like an awesome book! I love paper crafting and new ideas are always welcome. Sharing on FB. have also shared a link on Facebook..
As a paper crafter I've enjoyed your blog for some time, and I'm looking forward to checking out the book. It's wonderful to share my passion for paper arts with others, and to see such varied styles. This is a wonderful blog - you always find fabulous artists & share their work. I would love to win a copy of your book! i wonder if these examples are do-able? The giveaway has ended. Thanks for all of your entries and kind words. Thanks Steffi! I love to make paper keys. There are so many old, pretty ones to use as inspiration.